Enjoy views over the Howardian Hills from the large patio area and your dog will love all the walking opportunities nearby. 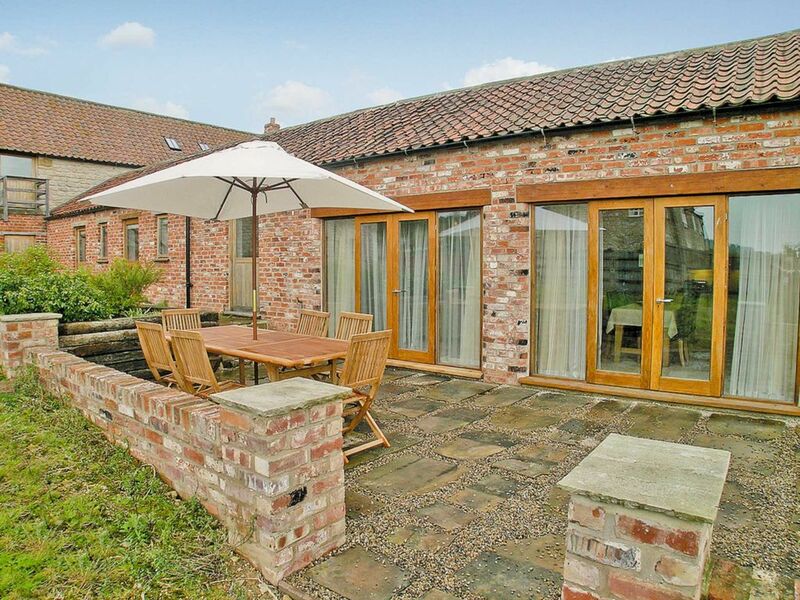 Set in a beautiful rural location on the edge of the North York Moors National Park, this former barn stands between a working farm and adjoins the owners’ home. Carefully converted to a good quality specification, the holiday property enjoys a spacious open-plan living area. French doors lead to a large patio with views over the Howardian Hills, an AONB. The attractive village of Oswaldkirk has a traditional pub serving food and is surrounded by a network of walking and cycle tracks. Shop 2 miles, pub and restaurant ½ mile. Living area: With wood burner, Freeview TV, DVD player, iPod dock and French doors leading to terrace. Kitchen area: With electric cooker, microwave, dishwasher and washing machine. Bedroom 1: With zip and link super kingsize bed (can be twin beds on request), single bed and single pull-out bed. Oil underfloor central heating, electricity, bed linen, towels and Wi-Fi included. Initial fuel for wood burner included. Cot and highchair available on request. Games room with pool table, air hockey, football table, games and books (shared). Welcome pack. Enclosed rear garden with patio with garden furniture and barbecue. Dogs to be kept on a lead at all times. Bike store. Private parking for 3 cars. No smoking.